Sexual harassment and intimidation of women is a hidden problem on public transport, with victims often choosing not to report their experiences. The British Transport Police has launched a more proactive approach to the issue in London, encouraging women to report sexual offences and committing to an emphatic response. Public reporting of incidents helps the BTP deploy its officers effectively across the London network. Image courtesy of Canley. Campaign groups have received thousands of stories of sexual harassment on UK public transport. Image courtesy of Jessica C.
Inspector Ricky Twyford of the British Transport Police. Image courtesy of the British Transport Police. Project Guardian will carry out regular patrols to help stamp out unwanted sexual behaviour. Image courtesy of Transport for London. There are many ways to judge the quality of a city’s public transport network. Do trains run on time? Are fares reasonably priced? Are carriages uncomfortably packed during rush hour? These are the variables that are relatively easy to quantify and use as benchmarks for successful franchise operations. But another benchmark, perhaps the most fundamental of all, is considerably harder to measure – do all passengers feel safe and respected on their journeys? Crime statistics and passenger surveys help with raw numbers and getting a sense for passengers’ feelings, but it remains a challenge to build an accurate picture of all the nuances of personal security on busy transport systems. What if, for example, there are offences that passengers don’t feel comfortable reporting to the police or transport authorities? This is exactly the problem identified by the British Transport Police (BTP) in relation to sexual harassment and intimidation of women on public transport, an issue that remains widespread and pervasive even on a network as crowded and heavily monitored as London’s Tube, trains and buses. "You won’t find many women who’ve not either been flashed at, or shouted at, or touched." 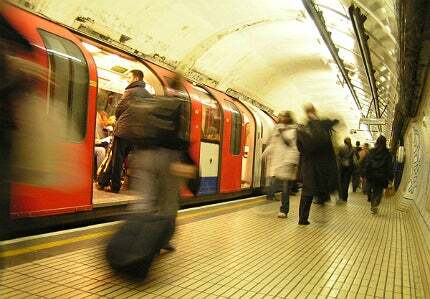 According to Transport for London’s (TfL) most recent safety and security survey, around 15% of London’s female public transport users have experienced ‘unwanted sexual behaviour’ on the network, but up to 90% of those affected didn’t report the incident to police. This startling disparity between sexual offences and the frequency with which they are reported has effectively hidden the problem from mainstream view, with women’s campaign groups such as Everyday Sexism and Hollaback UK facing an uphill battle to bring the issue to the public’s attention. "We have had around 5,000 stories from women of all ages describing sexism, harassment and assault on the transport network, from unwanted sexual comments and demands to groping and public masturbation, from being followed and harassed to being photographed against their will," Everyday Sexism founder Laura Bates said in July. Sara Green, campaigns manager for the End Violence Against Women Coalition (EVAW), notes the frustration among activists about the lack of an emphatic challenge to this behaviour. "It’s kind of infuriating that the transport system [in London] can put those little adverts all over the Tube and the buses about not putting your feet on the seats and not eating sticky food, but have never yet tackled serious sexist and sexually threatening behaviour, which is just so common," she says. "You won’t find many women who’ve not either been flashed at, or shouted at, or touched." The BTP is hoping to address these concerns with its recently-launched Project Guardian scheme in London. The project, which was developed with input from Everyday Sexism, EVAW and Hollaback UK, aims to increase public awareness of the problem and bolster women’s confidence to report threatening sexual behaviour, as well as spearheading a more proactive policing strategy. "The BTP wants to ensure that women feel their reports will be taken seriously." Project Guardian is now in full swing, with the BTP engaging in a number of social media and community-driven public awareness campaigns and a recent ‘week of action’ seeing 185 uniformed and plain-clothes officers patrolling London’s network, gathering intelligence and communicating with the public, and making nine arrests for sexual offences in the process. The BTP promises that these concerted sweeps will be carried out regularly, with the next operation planned for September. While the project is limited to London for now, transport authorities and BTP offices in other UK cities are paying close attention, and according to BTP Inspector Ricky Twyford, who has been involved in the project since its inception, the scheme could be rolled out elsewhere "based on the results we get from this one". As well as taking advice from activist groups, the team developing the project also looked across the Atlantic, to the Massachusetts Bay Transportation Authority (MBTA) in Boston, for inspiration. "[The MBTA] have run a very similar project and we contacted them once we’d drawn up our plans, and asked them how they addressed the problem," says Twyford. "A lot of the actions we intended to deliver were very similar to what they did deliver. They had huge success out there; they’d doubled the amount of reports when they did a four-year pre and post-project analysis." There are several prongs to the BTP’s anti-harassment strategy on London’s transport system. By raising public awareness of the issue through publicity campaigns, the police hope more women will feel confident enough to report incidents, and other commuters will be more likely to step in if a fellow passenger is being subjected to unwanted advances. And through the comprehensive retraining of frontline transport police, as well as the use of technology such as CCTV tracking, data analysis and text-based reporting services, the BTP wants to ensure that women feel their reports will be taken seriously and offenders will be pursued as aggressively as possible. Twyford provides an example of the importance of reporting in building a more detailed bank of intelligence. "We received a text message to our text service recently that someone had seen a male filming up women’s skirts on a Tube train," he says. "She didn’t know any more information than that, but that’s a vital piece of intelligence because it tells us a description of that person, where and when they were offending, and if we had another couple of reports of a similarly-described male, but perhaps on a different Tube line, we would be able to start painting a picture of where that person was offending and deploy officers appropriately." Of course, major operations like the recent week of action are not only designed to send a message of reassurance to everyday passengers. They are intended to send an equally strong message to opportunistic harassers and abusers on the network, from serious sexual predators right down to those who subtly intimidate women on empty train carriages at night. "We’re always digging at a very prevalent myth about sexual violence, that it’s just inevitable because some men who are semi-animals inevitably behave this way," says Green. "It’s not really true. When perpetrators behave like this, they are making a calculation about getting away with it, as well as whatever excitement it gives them. So if you can change that calculation by presenting a place where this is not tolerated and there’s a penalty for it, then you can change the behaviour." Why doesn’t the issue get reported? "The only people whose behaviour should change are those who are perpetrating this activity." Project Guardian’s retraining of officers and public engagement efforts have been informed by the answer to an essential question – why aren’t women reporting these issues to the police? Twyford says campaign groups were particularly helpful in defining the problem. "It may be that those being subjected to this type of activity aren’t aware of the protection they’re afforded by the law," he says. "It may well be they don’t have the confidence to come and talk to the police about it, that they don’t think they’d get the right response or that they don’t think we would be able to act upon the information they gave us." Green describes the feelings of helplessness that can be caused by these issues not being taken seriously by authorities. "If you’re not confident that when the behaviour is bothering you, that if you talk to a member of transport staff or a member of the police, that they’ll do something about it, you’ll become inured to a feeling that this is just something you’ve got to put up with as a woman," she says. Feeding into this lack of confidence are wider prejudices among the public and authorities that pressure women into downplaying incidents like this, or even blaming the victims themselves. Transport authorities in Beijing were the latest to fall back on this victim-blaming messaging earlier this summer, when officials advised women to avoid wearing short dresses on public transport, or even "shelter their bodies with bags, magazines and newspapers" to prevent sexual harassment, according to the China Daily. This is exactly the kind of mentality that the BTP is now trying to train out of its officers. "We don’t want anyone to have to change their behaviour to prevent becoming a victim," says Twyford. "The only people whose behaviour should change are those who are perpetrating this activity." One of the trickiest elements of tackling this behaviour, however, is that not all of it actually constitutes a criminal offence. Sexual assault and verbal abuse are clear-cut crimes, but what about the more insidious forms of intimidation, the kind that can be quickly denied if challenged? Twyford emphasises that reports on threatening behaviour that falls into a legal grey area are still important for intelligence-gathering and placing officers where they need to be. "Let’s say, for example, you have a male sitting and staring at a woman when the carriage is empty; there’s no offence per se but it’s intimidating. That piece of intelligence might actually slot in with two or three other things that had occurred and help us understand that person’s travel patterns – where they were going and what time they were going and so on. So if it’s that lesser behaviour we still want to hear about it and we can still act upon that information. Although we can’t necessarily bring someone to justice because there’s not a crime, it still helps us deploy our officers in the right places at the right time." Of course, the goal of any sane society should be to challenge and gradually overturn the prevailing culture that shrugs its shoulders at the casual harassment of women on our public transport and in our public spaces, and focuses on victims’ behaviour rather than that of their abusers. Sadly, that process is a long and arduous one, but in the meantime it’s encouraging that transport authorities are starting to recognise the problem within their networks, as well as their own responsibility to provide support to female passengers when they need it most. How is the evolution of mobile internet improving travel for rail passengers and operations for the companies that serve them? Is the air in underground subways harming our health? New research from Southampton University has shown that ultrafine dust particles – which are unregulated in the UK – are metal rich and more likely to cause health problems, such as cancer and emphysema, in workers and passengers than the larger, regulated dust particles.